A Roman colonia (plural coloniae) was originally a Roman outpost established in conquered territory to secure it. 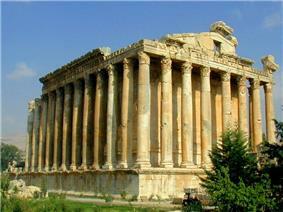 Eventually, however, the term came to denote the highest status of Roman city. The Roman Republic, having no standing army, used to plant bodies of their own citizens in conquered towns as a kind of garrison. Initially these bodies would consist partly of Roman citizens, usually to the number of three hundred; but after Augustus the number was increased and thousands of Romans who retired from their legions were granted lands in many colonies in the empire. In the first century of the Roman empire the colonies were made only of "veterans" and were responsible for the Romanization of many territories (mainly in the spread of latin language and of roman laws & customs). Nowadays neolatin languages are spoken in many of the areas where these veterans settled. After the era of the Severian emperors the new "colonies" were only cities that were granted a status (often of tax exemption) and in most cases during the Late empire times there was no more settlement of retired legionaries. 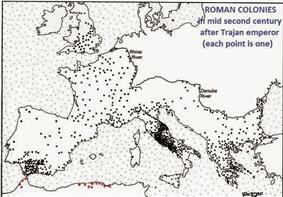 Coloniae also included towns founded by Rome to house those who held Roman citizenship. In Britain this usually meant those who had completed their military service in the Legions and were thus owed a grant of land by the state; see Marian Reforms.